The PowerKeepTM Wanderer is a lightweight, durable pack that not only hauls your gear, but is also capable of charging mobile electronic devices anywhere adventure awaits. Perfect for hiking, biking or fishing, this rugged daypack is equipped with plenty of pockets for maps, licenses or other documents, water bottle sleeves and sizable compartments for any other outdoor gear. The durable, solar-integrated daypack incorporates our innovative power bank right into the pack, keeping mobile electronic devices charged, wherever your adventure takes you! 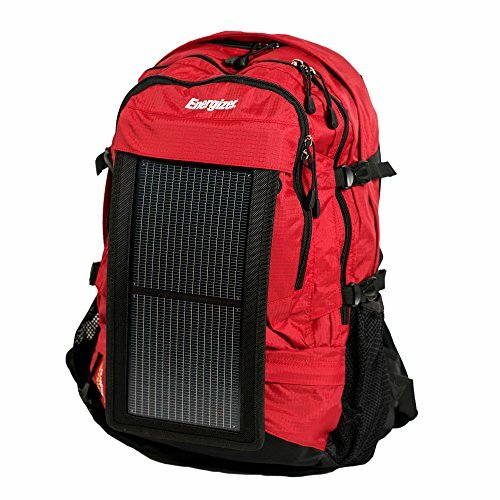 •COMPLETE CHARGING SOLUTION: includes backpack, solar panel, PK10K 10000mAh powerbank, micro-USB cable. Charge smarphones, tablets, speakers, USB devices. •Backpack has comfortable, padded shoulder and chest straps designed to relieve pressure on your back. Hydration ready! •Plenty of ZIPPERED COMPARTMENTS and interior pockets for maps, licenses or other documents, water bottle sleeves and places for other outdoor gear. Side pockets to carry water bottles. Stow the powerbank and cable in the convenient pocket on the back of solar panel or inside the backpack. •REMOVABLE SOLAR PANEL IS DURABLE, LIGHTWEIGHT AND FLEXIBLE unlike conventional solar panels. A clean energy solution. •RUGGED CONSTRUCTION-available in red, green, camo colors.